After the huge Success of Tetris it was clear the Sega made there own puzzle Game and here we have Columns. There are 2 different game types: The Original mode, were you just play as long as you can and the Flash mode were you play against the clock. The main difference between Tetris and Columns is, while in Tetris you just must made rows in columns you must get three or more blocks in one row. This can be quite difficult in later levels. In the flash mode you start out with a selectable number of rows filled with pieces. At the bottom is one flashing piece. Your objective is to clear all rows and then the flashing one as fast as you can. 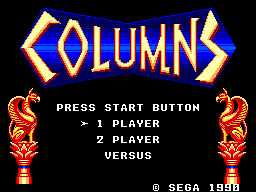 Columns also features two multiplayer modes. At first we have the usual Versus-mode. Two players, two play fields and you play as long as one of them hits game over. The other mode is interesting, both player play in the same field and they drop the stones by turns but you still play against as everyone has its own scoring panel. So this mode is quite challenging, as you can't play for your own but you still must try to get more Points than the other player. You can also play the flash mode in two player mode. The Difficulty depends on the Level you start with. Level 0 is slow and there is no problem to point your stones. Level 9 is fast as hell and you can't do anything as just drop the stones and hope to make some points. And you can choose the difficulty. Easy meant you have just 4 different Blocks, medium is 5 and hard has 6 different blocks. The Graphic is basic, nothing special. 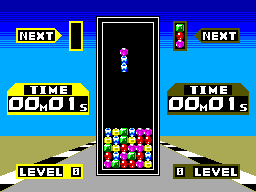 The Background of the Original mode is a moving star screen and in flash mode you have a moving race track on the ground. But you can choose the type of blocks you want to play with. Columns features everything from fruits over crystals to dices. The sound is very repetitive. In both modes you have one piece of music which loops endlessly, while the song in flash mode is quite catchy, the original mode sound get annoying fast. There are also some nice sound effects when you drop a block or clear a row. The controls are good and easy. You control the blocks with the D-pad and with the button you arrange the blocks. Even on Level 9 everything reacts fast. 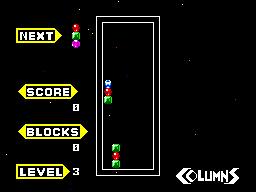 Columns has the same replay value as Tetris. With the two different play modes and the different multiplayer modes you can play this game a hundred million times and it won't get boring. I like this game a lot more than Tetris, cause it's way more challenging.